Guy Chadwick, Terry Bickers, Andrea Heukamp, Chris Groothuizen and Pete Evans formed The House of Love in 1986 in Camberwell, London. They released three singles and a debut album while signed to Creation records. After this, they switched to Fontana records and released their second album, which was, like the first, untitled. 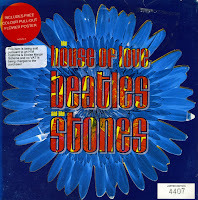 Three singles were released from this album, of which 'The Beatles and the Stones' was the third. It reached number 36 in the UK singles chart. This limited edition release included a poster and a foldout sleeve. I bought it mainly because of this, since I wasn't that impressed with the track at the time. Now, almost two decades later, I actually think it's a great track.